From Route 95 (also known as route 128), take Exit 16B (Rte. 109 Westwood). 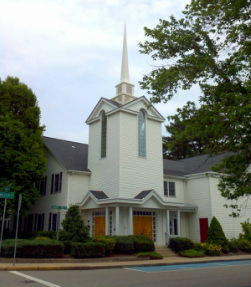 Drive through Westwood, Walpole, Dover, and into Medfield center (about 10 miles). At the second set of lights in Medfield center there is a Starbuck on the right and a Bank of America on the left. The United Church of Christ is located immediately after the bank. Turn left on Miller Street (just before Park Street Books) where you can park on the street. Enter the doors at the corner of Route 109 (Main Street) and Miller Street. From Route 27, turn at the intersection of Route 27 and Route 109, traveling east. Cross over the railroad tracks. Miller Street is the second street on your right, just after Park Street Books. Please be considerate of our neighbors when parking Sunday mornings. There is parking on the street on Miller Street and in the municipal lots across Main Street from the church. The Roberts-Mitchell Funeral Home has invited us to park in their lot off Park Street as well. Please do not block access to any of the bank drive-through windows nor park in front of the real estate agencies who often conduct business on Sunday mornings.